National Transportation Safety Board investigators survey debris from Virgin Galactic's SpaceShipTwo in California's Mojave Desert on Nov. 1, 2014, one day after the commercial space plane broke apart during a test flight from the Mojave Air and Space Port. Virgin Galactic's SpaceShipTwo broke apart in midair before crashing to the ground during a test flight Friday (Oct. 31), investigators have determined. 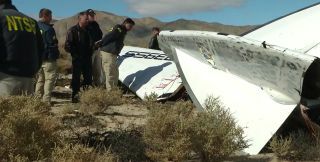 The debris field resulting from Friday's tragic accident, which killed one SpaceShipTwo pilot and injured the other, measures about 5 miles (8 kilometers) from end to end — so large that the suborbital space plane could not have come down in one piece. The two test pilots on Friday's flight, Michael Alsbury and Peter Siebold, both worked for Scaled Composites, the Mojave-based aerospace firm that builds and tests SpaceShipTwo for Virgin Galactic. Alsbury was killed; Siebold survived but was taken to a nearby hospital. Apparently, Siebold managed to get out of SpaceShipTwo but Alsbury did not. "We know that one [pilot] was out of the airplane; we don't know how that pilot got out of the airplane," Hart said. "We know that there was a parachute that was found where that pilot was. We know that the other parachute was found undeployed." The NTSB team has not yet talked to Siebold because doctors have advised against it at this point, Hart added. More answers should be forthcoming as the investigation continues. The investigators will likely spend four to seven days examining the crash site, then about 12 months analyzing and interpreting what they've found, Hart said. "We intend to find out what caused this accident, and make recommendations to prevent it from happening again," he said. The team's work will be aided by the presence of six cameras on SpaceShipTwo and three on its carrier plane, known as WhiteKnightTwo. (WhiteKnightTwo lofts the six-passenger space plane to an altitude of 50,000 feet, or 15,000 meters, at which point SpaceShipTwo is dropped and its rocket engine kicks on.) There will be lots of other sources of information to analyze as well, Hart said. "Because it was a test flight, it was heavily documented, in ways that we don't usually see with normal accidents," Hart said. Friday's flight was the fourth rocket-powered flight test of SpaceShipTwo, and the vehicle's 55th flight test of any kind. Prior to the accident, Virgin Galactic was on track to potentially begin suborbital spaceflights by 2015. The air-launched SpaceShipTwo is designed to fly two pilots and six passengers up to suborbital space and back. Tickets cost $250,000 per seat and Virgin Galactic has about 700 reservations from customers. Sir Richard Branson, Virgin Galactic's billionaire founder, mourned the loss of Alsbury, whom he did not know, in a blog post Saturday. "Mike was an accomplished test pilot and had worked for Scaled Composites for 13 years. Beyond his skills as a pilot — including 1,600 hours of flight time in research aircraft built by his colleagues at Scaled — Mike was a dear friend and inspiring colleague to the many, many friends he left behind. My heart goes out to his parents, his wife and children, his sister and the rest of his family and friends," Branson wrote. "I do have the privilege of knowing Pete Siebold, Scaled's injured test pilot. Pete is Scaled's director of flight operations and among the incredibly dedicated and talented team helping to realize so many people's dreams of reaching space. We all wish him a speedy recovery."